Helen Alma Newton Turner graduated Bachelor of Architecture with Honours from the University of Sydney in 1930 during the depres­sion and could find no better job than that of a secretary in an architect’s office. When It closed a year later she was appointed secretary to Ian Clunies Ross, the head of CSIR’s McMaster Animal Health Laboratory at the University of Sydney. He recognised her potential and arranged for her to go to England for a year to study statistics applied to agriculture. This was the start of a scientific career that would see her recognised as one of the pioneers of sheep breeding internationally. Helen Newton Turner introduced important new concepts to Merino sheep-breeding in Australia. 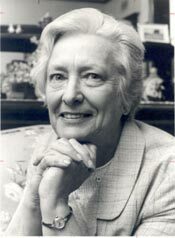 She led CSIRO’s sheep breeding research from 1956 to 1973 as the Senior Principal Research Scientist in the Division of Animal Genetics. Helen Newton Turner was not only an outstanding experimental scientist; she was also a theoretician. Together with a colleague she published what is now a standard text, widely used in sheep growing countries throughout the world, on the theoretical side of quantitative genetics and sheep breeding, but she was not satisfied with simply demonstrating her findings. She travelled widely within Australia, giving seminars at universities and other institutions, participating in short courses, and talking to breeders wherever possible. She became well known in country areas, partly through her lecturing and partly because for many years she broadcast on the ABC’s Country Hour. Her message was clear: use measurement, as well as judging your animals by eye. She has been an inspiration to a generation of quantitative geneticists and sheep breeders and is rightly regarded as a world expert in her field, not only for her contributions to the Australian Sheep Industry, but for her generous efforts to assist the welfare of third world peoples by improving the productivity of their domestic animal populations. McKay A, 1976, ‘Twinning in sheep’, In: Surprise and Enterprise – Fifty Years of Science for Australia, White F, Kimpton D (eds), CSIRO Publishing, pp.36-37.